In the ruins of a place once known as North America lies the nation of Panem, a shining Capitol surrounded by twelve outlying districts. 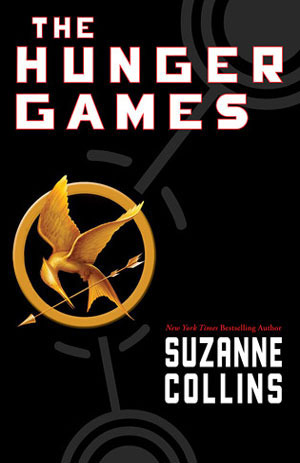 The Capitol is harsh and cruel and keeps the districts in line by forcing them all to send one boy and one girl between the ages of twelve and eighteen to participate in the annual Hunger Games, a fight to the death on live TV.Sixteen-year-old Katniss Everdeen, who lives alone with her mother and younger sister Primrose, regards it as a death sentence when she steps forward to take her sister's place in the Games. But Katniss has been close to dead before — and survival, for her, is second nature. Without really meaning to, she becomes a contender. But if she is to win, she will have to start making choices that will weigh survival against humanity and life against love. Like much dystopian fiction, The Hunger Games initially urges us to focus on plot and theme because it seems to comment on today's society. However, plot and theme don't make a mega bestseller; for that, readers need to fall in love with one or more characters. Choose a favorite character from The Hunger Games and dissect how Collins created him or her. Look at specific traits, how that character acts in the book's situations, and the pace at which Collins reveals that character. What do you learn about characterization that you can apply to your own writing? My favorite character is definitely Rue. She’s this tiny twelve-year-old from District 11 that you just know from the minute she first appears that she’ll die some horrible death. What I didn’t expect was the depth which Collins gave to her character. We were relieved when Katniss saved her sister, but now there’s another little girl going to the games, and we have no choice but to feel sad for her. The passages Collins uses to describe Rue, always present her as small and delicate. Again, we feel sad for Rue for being so young. But later, Collin intrigues us when we hear Rue scores an eight in the solo presentations, and it leaves us wondering just what could a tiny little girl do to impress the game makers. During interviews night, Rue appears dressed as a butterfly and she says, “I’m very hard to catch,” she says in a tremulous voice. “And if they can’t catch me, they can’t kill me. So don’t count me out.” (End of Chapter 9) And against all odds, I didn't want to count her out. She's tiny, she knows she doesn't have a chance of winning, yet she isn't giving up! I couldn't help but cheer her on. Once the Hunger Games started, I sort of forgot about Rue. So when she appeared in that tree I was probably as startled as Katniss. Rue turns out to be observant (when she warns Katniss of the tracker jacker nest), reliable (when she helps Katniss cure the stings), and clever (when she teaches Katniss the mockinjay tune to use as a signal). She’s pretty excited with Katniss plan to get rid of the Careers supplies, and she’s the only one who can still giggle at that point in the Games. All of this we learn about Rue in Chapter 16, and since I was intrigued by Rue's appearances so far, it didn't feel like an info dump (character dump?). Sadly, Rue dies in Chapter 18, which I did found too abrupt. I mean, we we're just starting to get to know her. But I guess that it ties up perfectly with the mood of the book. It’s also turning point for Katniss, when she realizes Gale's "ravings against the Capitol no longer pointless, no longer to be ignored. Rue’s death has forced me to confront my own fury against the cruelty, the injustice they inflict upon us.” With this I learned that secondary characters can (should?) enhance our main characters. Personally, I don't like Katniss very much, and if Rue wasn't there or if Peeta wasn’t there, I'm pretty sure I'd hate her. Katniss shines her brightest when she's helping Rue, and taking care of her, and making her giggle. It's interesting, hearing about her life. We have so little communication with anyone outside our district. In fact, I wonder if the Gamemakers are blocking out our conversation, because even thought the information seems harmless, they don't want people in different districts to know about one another. What it must be like, I wonder, to live in a world where food appears at the press of a button? How would I spend the hours I now commit to combing the woods for sustenance if it were so easy to come by? "It doesn't matter, Katniss," he says. "I've never been a contender in these Games anyway." "That's no way to be thinking," I say. "Why not?" It's true. My best hope is to not disgrace myself and…" He hesitates. "I don't know how to say it exactly. Only…I want to dies as myself. Does that make sense?" he asks. I shake my head. How could he die as anyone but himself? "I don't want them to change me in there. Turn me into some kind of monster that I'm not."